Lying in bed, I stared at the ceiling in the dark, too tired to sleep. You’re so worn out that you can’t wait to go to bed, sure that you’ll pass out as soon as your head hits the pillow. But instead of slipping into blissful unconsciousness, your mind decides to start running a marathon, going over (and over and over) every worry, every hardship, every doubt, every item on your never-ending to do list. It was 2013 and our web design business had gone belly-up. Business had simply stopped coming in, with people deciding they’d rather save money and buy a pre-made template than shell out for a custom website. To make matters worse, the web design agency I contracted with decided to switch to a content management system I was unfamiliar with, and decided to let me go rather than train me in how to code for it. We’d never been wildly successful to begin with. Although we made ends meet, we didn’t have a safety cushion, and my husband’s income wasn’t enough to cover the bills and living expenses on its own. Desperate, I began looking for a full-time job outside of the home, but interview after interview resulted in disappointment and closed doors. Our ship was sinking fast, and we didn’t have a life preserver. By this point, my husband and I were no strangers to hardship. We’d already had a string of bad years that included me getting laid off from a good job with good benefits, two miscarriages, the passing of both of my inlaws and of two pets, and there had been very little time to recover in between all of those battles. So when I say I was tired, I don’t mean that I was worn out from a hard day. I was feeling beaten down and defeated from what had come to feel like a hard life. I was weary in my soul, not wanting to face another day, fearful of what new hardship it would hold. I knew I should pray, but I couldn’t. God felt so distant, and I just didn’t have the energy. Even if I did, I didn’t know where to begin. It’s a hard, miserable place to be. Maybe you’re there right now. If you are, I want you to know that God is still with you. He hasn’t forsaken you, no matter how distant He may feel. God is praying for you. Scripture tells us that Jesus Himself intercedes for us at the right hand of God the Father (Romans 8:34). It alsy says that when we don’t know how to pray, the Holy Spirit intercedes for us with groanings too deep for words (Romans 8:26). You don’t need to have the right words. You don’t need to know where to begin. You only need to call out to Him, and your Savior and the Holy Spirit will meet you where you are and take care of the rest. If you look for Him, He’ll be there. Jeremiah 29:13 promises, “And you will seek Me and find Me, when you search for Me with all your heart.” Sometimes, all that’s required to seek Him is to simply be still and know that He is God. Just sit quietly, breathe out His name, and let that be your prayer. He wants to hear what’s on your mind. Of course He already knows, but that’s not the point. Phillipians 4:6-7 tells us to bring everything to God in prayer, with thanksgiving, and promises that if we do, we’ll experience His ultimate peace.Don’t be afraid to pour out your heart to God–all of your pain, hurt and heartache, all your frustration and anger, all of your worry, fear and doubt–all of the dark and ugly, even the stuff directed at Him. Believe me, He can take it. And as you pour out all of that heart-junk, He’ll be able to fill up your empty places with His peace that is beyond human understanding. Thanksgiving makes you stronger. I know you’re probably not feeling a lot of gratitude at times like these, but God commanded us to always give thanks for a reason. Part of that reason is that there is always something to be thankful for, even if you have to dig deep or go back to basics to find it–even if the only thing you can think of to give thanks for is that you’re still conscious and breathing. The main reason, though, is that focusing on what we have to be thankful for, instead of dwelling on what we lack or what we wish were different, cultivates a sense of contentment that produces joy. And God’s word tells us that this kind of joy — the joy of the Lord — is our strength (Nehemiah 8:10). Give yourself grace, lift up your eyes and call out to the Lord, pour out your heart to Him, and focus on what’s good in your life, no matter how small. 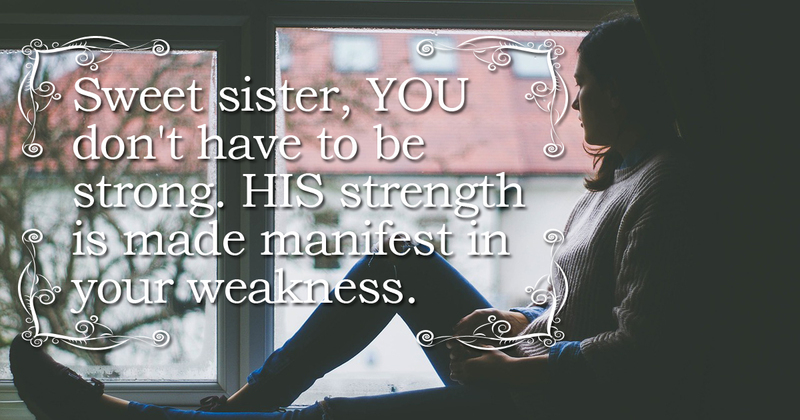 This is the recipe for spiritual strength–and there’s one more thing I want you to remember, sweet sister. YOU don’t have to be strong. HIS strength is made manifest in your weakness. God’s love for you isn’t based on your ability. His grace meets you where you are and makes up for all of your human weaknesses, frailties and failings. God loves you, period. If you’re stuck in a place where you’re feeling too week and worn down to pray for yourself, let me know in the comments (anonymously if you want), and I’ll pray for you today. PS – This week I’m linking up with Holley Gerth’s Coffee for Your Heart and Faith Filled Friday at MissionalWomen.com. “Give yourself grace, lift up your eyes and call out to the Lord, pour out your heart to Him, and focus on what’s good in your life, no matter how small. This is the recipe for spiritual strength…” Yes, our strength comes from God. There have been times when I’ve not known how to pray, but I rest in the knowledge that He knows and even if I can’t speak the words, He hears and answers in His timing what is best. I’m visiting from #CoffeeForYourHeart. Blessings to you! I’ve found that to be so true, Gayl. Thanks for sharing, and for stopping by! Wonderful reminder of grace. Thank you for sharing! Glad to meet your acquaintance on “Coffee for Your Heart.” Have a beautiful week! Thank you, Carolina! Blessings to you.